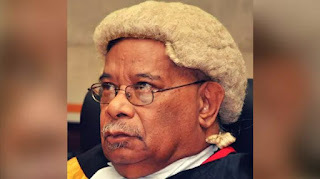 Justice Minister and Attorney General, Davis Steven has revealed the resignation of senior judge, Justice Sir Bernard Sakora from the National and Supreme Courts. In a statement today, Minister Steven says, he has advised the prime minister of Justice Sakora's resignation. The senior judge has given 25 years of service to the nation, making him the second longest current serving judge to the Deputy Chief Justice Salika. Mr Steven says Justice Sakora resigned on his own accord, to take rest from public office. Sir Bernard leaves a legacy behind in his strong punctuation of academic reasoning, and his grammatical flair sets his recorded decisions apart. Minister Steven thanked Sir Bernard for serving the judiciary and the country as a judge. The resignation of Justice Sakora effectively terminates formal investigations into misconduct allegations against him, initiated by the Judicial and Legal Services Commission, and a separate Leadership Code investigation process, instigated by the Ombudsman Commission.